Running through the Sonoran Desert during the summer might sound foolish at best but there's only one way one man from England is willing to cross the continent: on foot. 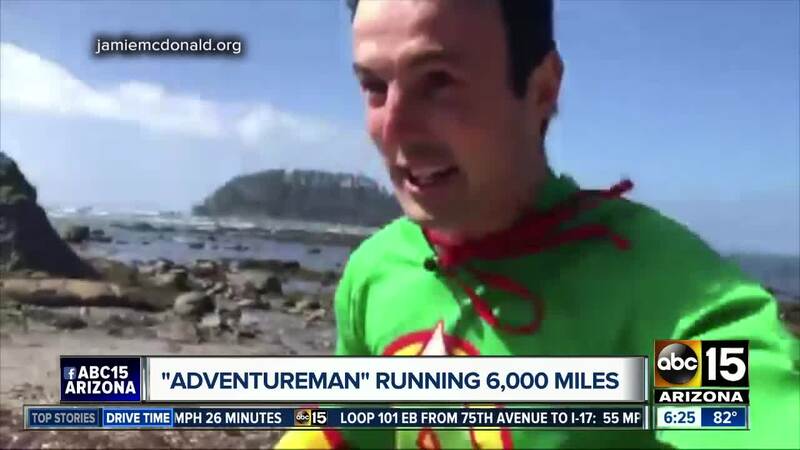 If you see a cape-clad superhero in a colorful getup running across Arizona, don't worry. It's just "Adventureman," aka Jamie McDonald. "He just keeps going no matter what. He just keeps grinding it out," McDonald said. He's not talking about himself. He's not even talking about a person. Caesar is a stroller filled with supplies, and she's the only companion on his coast-to-coast trip. Arizona has dealt him some surprise visitors along the way, like when a woman spotted a mountain lion. "Forget the mountain lion...I'm petrified of spiders. There were just tarantulas everywhere, like all over the roadside. [Then] I see a snake, I'm like, 'it's too much for Adventureman.'" Crossing the Sonoran Desert is proving to be a challenge but Jamie is not about to give up. As a child, he spent a lot of time at a Children's Hospital in Great Britain with a condition that can cause paralysis. 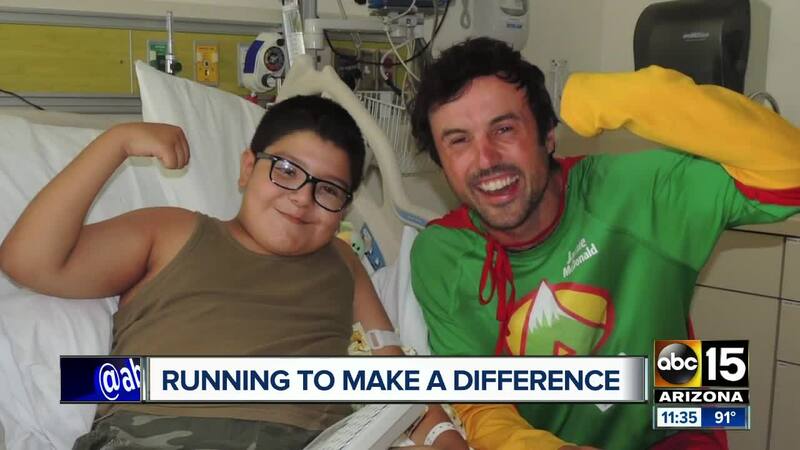 Now he's committed to using the year on his tourist visa in the U.S. to raise a million dollars for medical centers across the country by running from the westernmost point in Washington state all the way to New England. He's calling on all would-be heroes to make a difference. "One of the reasons I wanted to come to America is because everyone thinks big and they're positive. I just want to make the biggest differences possible and I think we can do it in America." You can track Jamie's progress live and you can donate to the Superhero Foundation on Jamie's website .